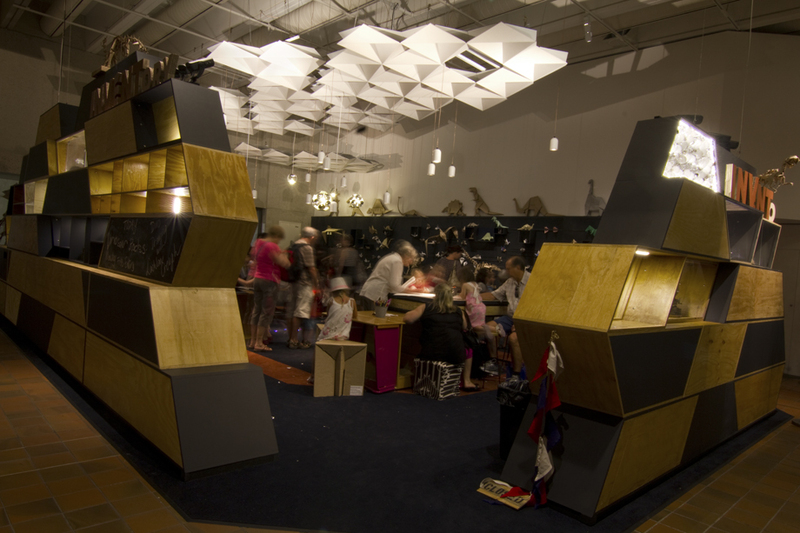 Kuuki (Priscilla Bracks and Gavin Sade) worked with designer Jess Lenton to create an all-ages activity space for the Queensland Museum called the Invent-ory. The design compliments the Museum’s collections and research interests in bio-diversity, geo-science and cultural history. 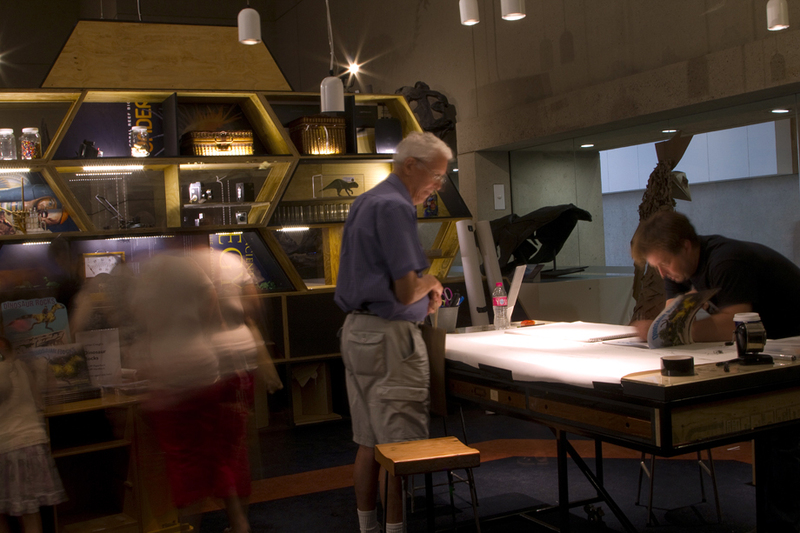 Its flexible design allows the Museum to host workshops, functions, and lectures. Our brief required a reconfigurable space created from reclaimed and recyclable materials. We used existing materials wherever possible. 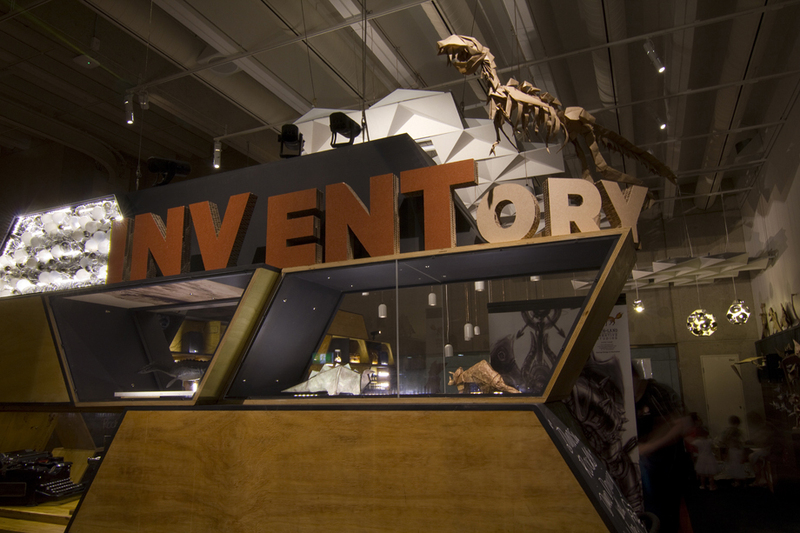 The Queensland Museum has a mind-boggling store of materials left over from previous exhibition. We sifted through their warehouse storage facility at Hendra finding treasures such as diorama boxes used in the 1970’s for travelling education workshops in Queensland primary schools. These boxes became seating when combined with old display plinths and cushions upholstered from fabric exhibition banners. Large quantities of silver light reflectors were converted into feature lights, and old tungsten bulbs were used to fill a feature light box in the storage shelves. 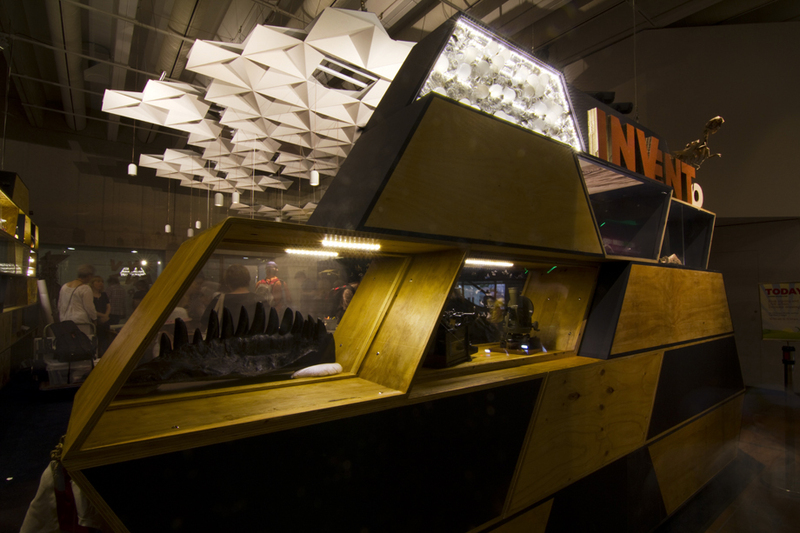 Didactic panels from previous shows feature extensively in the shelves and workbenches. Other plywood in the shelves originally formed part of a theatre floor in the Queensland Art Gallery. All furniture, fittings and flooring is fixed without glues so that it can be disassembled for reuse or recycling. Acoustics was also a major design issue. The space sits within a larger concrete atrium in the Museum. The atrium’s 10 metre high ceiling, concrete walls and tiled floor, create sound reflections that unaddressed would make workshops, functions and talks untenable. We sectioned off the space with shelves and incorporated highly absorbent acoustic materials on the ceiling and walls, to reduce sound reflections. 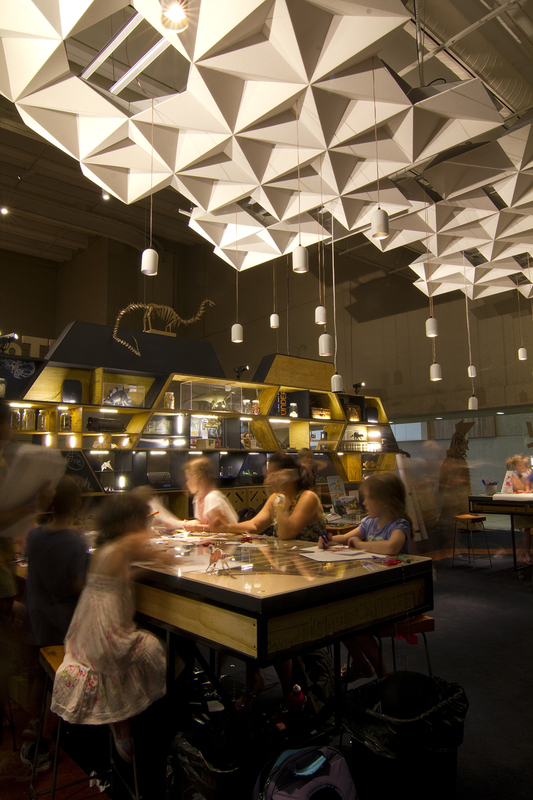 The space sits within a larger 10 metre tall atrium in the Museum alongside the skeleton of a Muttabuttasaurus. The workbenches were constructed from reclaimed metal and topped with panels that had been stored for many years. 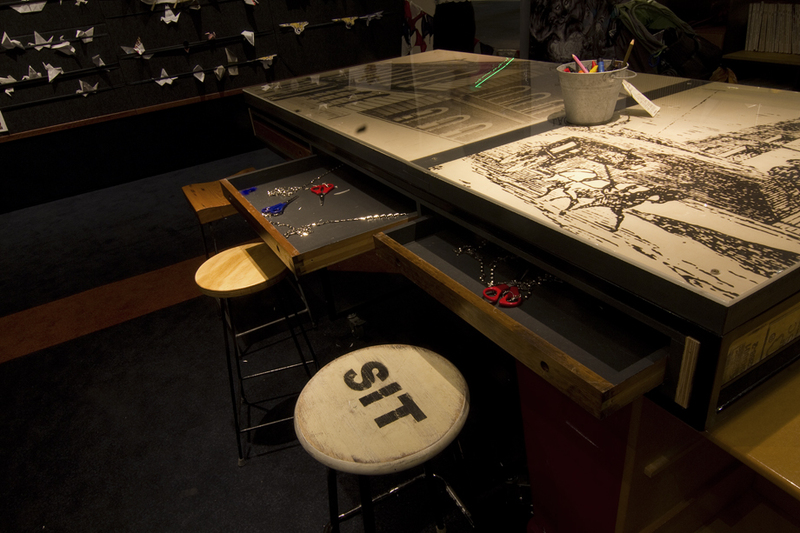 The panel on this table top has a potograph and illustration from the Old Museum site in Bowen Hills. Seating in the space was created by furniture designer James Talty. 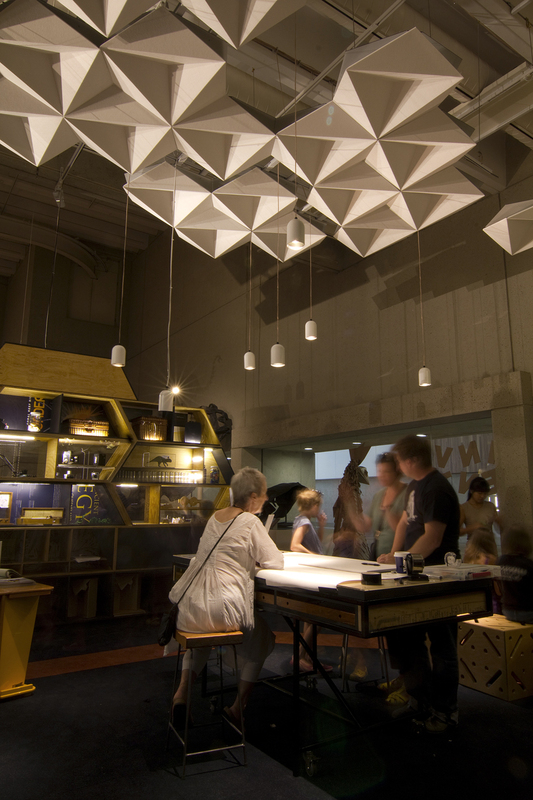 The ceiling was created by folding Echopanels, a felted sound dampening product made from recycled PET. 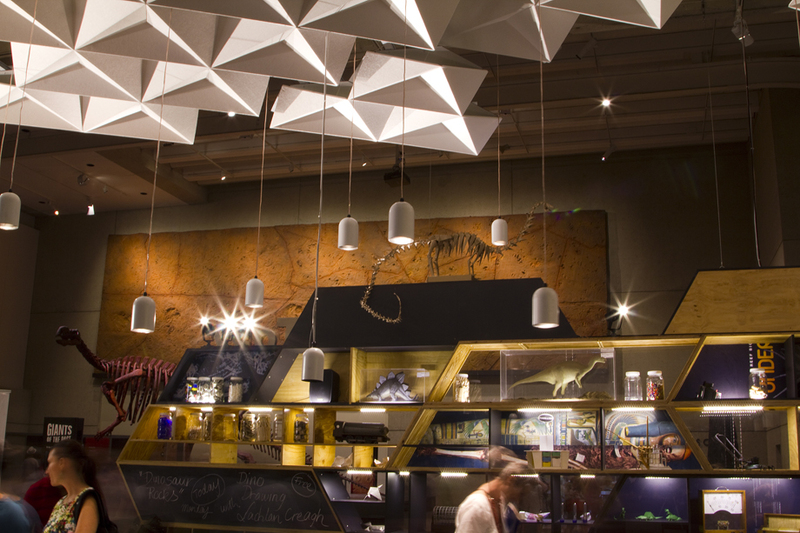 The product was cut into diamond segments that were arranged as hexagons to reflect the Queensland Museum’s use of this shape in their branding. No glues were used on the acoustic cloud so that it could be completely recycled if decommissioned. The display panels were also made from Echopanel screwed to unwanted, carpet-covered, open-plan office dividing panels. Bicycle tyre tubes were obtained from bike repair shops by one of the project’s initial build staff, Mark Burrell. 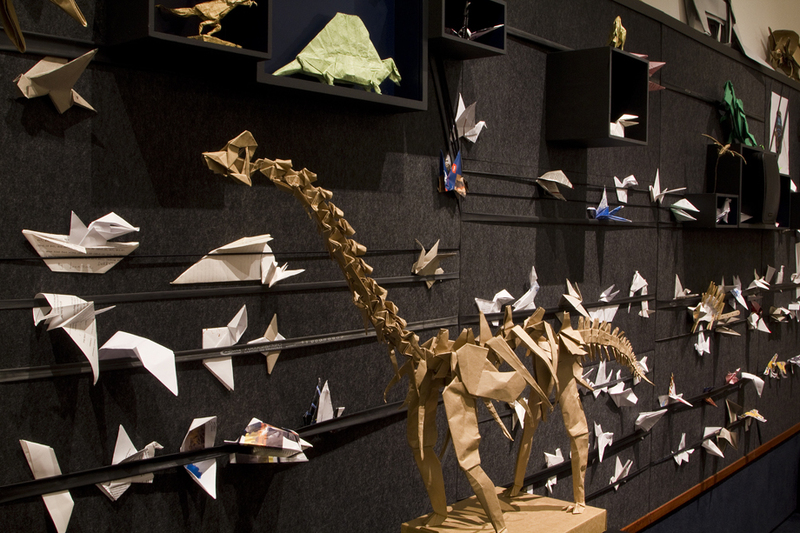 These were used as strapping on the display wall, providing a place for people to display objects they make.